The latest?issue of Dogster magazine (Dec. 2016/Jan. 2017) has a very nice two-page article on the farm, which I scanned in and have posted here. They don’t seem to have this on their website yet, which is why I’m using these scanned images. I did the interview with the writer via email back in June, and then sent photos to accompany the story. That’s why most of those photos may seem familiar to long-time blog readers! I will say that we are a little uncomfortable with the term “heroes” being applied to us. Yes, I think Alayne and I do good work, and these disabled animals reward us immensely for it, but heroic it isn’t. My personal view is that we as a society use that’term’too casually. It should be reserved?for people who put their lives at risk for others, or overcome incredible challenges of one sort or the other. Just my editorial comment, for what it’s worth! 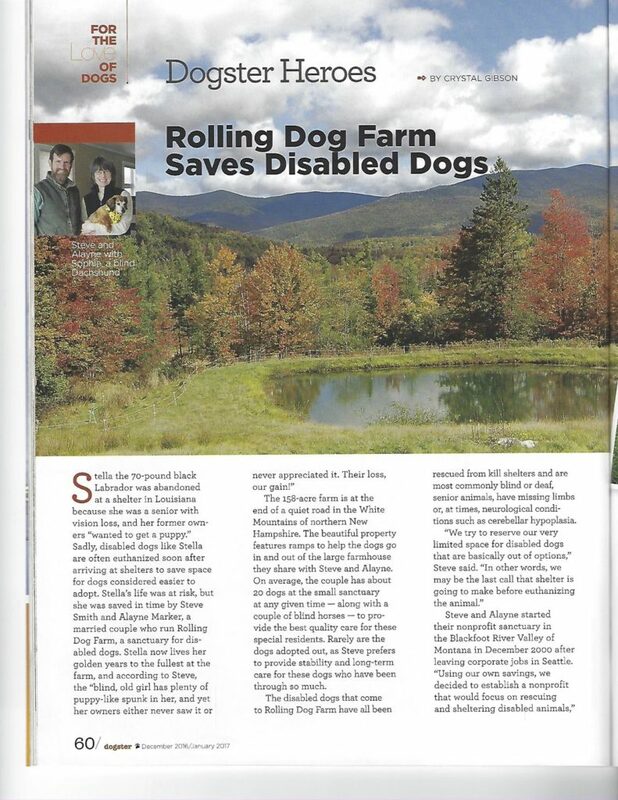 In any case, this article is part of a longstanding series in the magazine highlighting various “Dogster Heroes,” both human and canine, and we are honored the magazine chose to focus on our disabled dogs?for this edition. 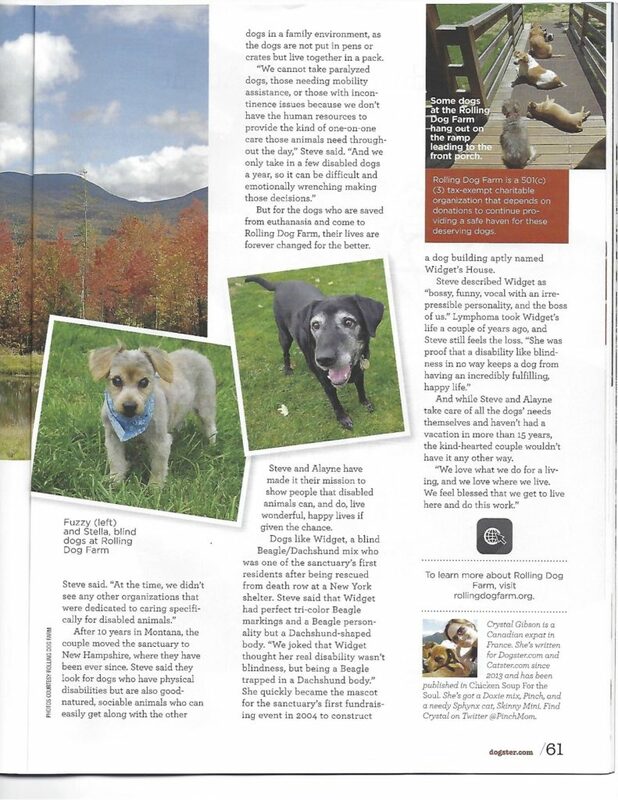 It’s a lovely write-up on what we do and shows how disabled animals can have a wonderful quality of life. Thank you, Dogster! I have no wish to make you uncomfortable, but . . .
You’re right. “Hero,” like most other concepts, is overused and has lost some meaning. I think back, however, to the movie “Yankee Doodle Dandy,” and to the scene in which George M Cohan protests receiving the Congressional Medal Of Honor, saying that it’s for men who gave their lives for their country. President Roosevelt counters that a man can give his life for his country in more than one way. No, you’re not risking life and limb, but I would ask you how many vacations you’ve taken lately, or when was the last time you and Alayne even went our for a leisurely dinner and a movie. You’re not dying for your animals, although you suffer when they do and are hurt when they die, but you’re living for them. And, in the long run, that’s more important. Again, I don’t want to make you uncomfortable, but I will tell you that I have only three heroes in this rapidly decaying world of ours, and two of them live in your home. Thanks for sharing this wonderful article. Yes, while WW2 veterans will say that the real heroes are those who never came home, there is another kind of hero, the kind who devote themselves whole-heartedly to a good cause, and that is you and Alayne. I have great admiration for you and what you do. I am sure all your dogs consider you their heroes. Also thank you for the latest newsletter, it was excellent as usual! Wonderful article! So happy to see the work the two of you do – and have done for so long – highlighted and recognized. Been way too long since I’ve seen you or said howdy; maybe someday I’ll make it all the way out to NH to visit. Congratulations! I’m 100% with Jerry. And a new fan of Dogster as well. I admire all of the devotion in spirit, care and effort on behalf of not only the animals in your care, but in communicating so effectively on behalf of others …that you and Alayne are “24/7”. Your commitment is incredible. Thank you so very much for all that you do. Awesome article! You two deserve to be recognized for the work you do. I greatly admire you both. Happy holidays to you and the critters! An excellent article. Thank you, Dogster, for sharing what their ‘fan club’ already knows about Steve and Alayne, two of the most caring and self-sacrificing people on earth. I concur with Jerry’s comments – you two severely under-rate yourselves and all you do to give the animals decent and well-loved lives. You are both heroes. Just ask each of your many rescues!